From good ol’ penny pinching to personal loans, we sort through it all to find you the best option to pay off your debt and stay out of debt. The number one rule of staying out of debt, avoid fees and interest at all costs. The rich do not pay interest and fees, which is why they stay rich. Though it may be unavoidable in some cases, keeping your interest as low as possible is key. Apply any extra funds to paying down your debt, starting with the highest interest first. Always pay off the highest interest first, because when the debt is gone, so is the interest. Remember, in many cases you can write off student loan interest on your taxes. For those of us who have already made all possible cuts and pinched every penny, a personal loan could be an option. Personal Loan interest rates are often much lower than credit card interest rates. It’s easy to apply for personal loans in person at the bank or go online and do it in your PJ’s. There are loads of companies like Discover Bank, Quicken Loans, and Lending Tree, to name a few. 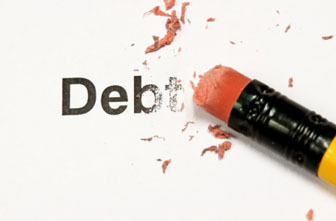 A personal loan to pay off debt is only wise if you are paying less interest on the loan than you previously were. For example, if you are paying 23% per month in interest on a credit card with a high balance, a personal loan at 9% would be a wise move. In most cases, you can expect rates of around 7%, all the way up 30% APR, with options to pay off the loan ranging from 36-84 months. Having a credit card with the same place you are trying to obtain a loan from can help you get a better rate, ask the credit card company to quote you on a rate if they haven’t bombarded you with mail already. Besides the interest, there shouldn’t be any additional fees, and if your credit score is good, you could have many banks vying for your business with plenty of attractive interest rate offers. In some cases transferring your balance to a credit card with a 0% interest grace period could be a wiser move. This usually requires a fee of 3%, (and sometimes even 0%!) and the grace period can last anywhere from 12 to 18 months. A three percent loan for a year or more is a pretty good deal for most of us. We all know it’s foolish to buy an expensive coffee drink every drink every morning. But for those of us without a latte factor, how do you get blood from a turnip? Cut out as many recurring charges as possible. Think to yourself, what can you do without? How long can you go without buying anything new? Make it a challenge. Can you cancel your gym membership and ride a bike to work? That would also prevent you from buying gas and could give you more time in your day. Do you really need cable TV? Until your debt is paid off, don’t be afraid to scrimp and save. When you see your savings on your bank statement, the good feeling will make it all worth it. Have a garage sale, sell a few things online, put in some extra hours, get a little part-time job on the side, and put all that money towards your debt situation. Once it’s paid off you will sleep easy. Keep the lights low and get LED light bulbs, use less heat and air conditioning, be creative. If you have a low income, many utility companies offer a lower rate, be sure to check to see if you qualify. Don’t be too proud to use coupons and free offers. Sign up for credit card and bank rewards. Banks need your business. Many will offer you a bonus of $100 dollars or more to sign up for a bank account with direct deposit. Having multiple accounts can spread your money thin, but if you can keep track, an extra hundred or two towards your debt is a very good thing. Only buy what you can afford. This may seem like a no brainer, but it can take great willpower to question every purchase. Remember when you were a kid and you learned about needs and wants? It’s the same principle.